This book 2012 written by Matthew Driver, a man who I have struggled to discover much about is aimed at the complete Forex newbie. The presumably an attempt to cash in on the growing interest there has been in the Forex markets. This concise book is divided into number of different chapters assuming no prior knowledge of the Forex markets making it accessible to even the most financial unaware individuals. While there are many introductory Forex books on the market there are a few things that set this apart from many of the other books. 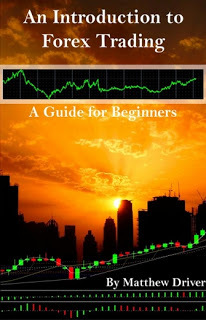 Where this book really excels is in the amount of information it provides about trading Forex going beyond what many introductory books offer. I have noticed that many introductory Forex books stick to explaining how the Forex markets work and explain the basic mechanisms of a trade without going much beyond that. I mean they may talk about a few trading strategies but often they don’t go into enough detail to allow you to actually start trading the market. Driver for example provides a pretty comprehensive introduction to charting techniques which would be a real help if you were a newbie trader. While the book provides a enough information to get someone on the road to Forex trading I would still not recommend that having read this book you jump straight away into real money trading, your probably going to want to do further reading and introduce yourself to some more complex works. However this book will provide the foundation you need to in order to engage with more advanced material. CFD’s Made Simple: A Straightforward guide to contracts for difference is a 2009 book published by Peter Temple. The book promises to provide individuals with a concise guide to CFD’s all written in an accessible way. Peter Temple appears to be a journalist who writes on a number of investment related topics previously having been an equity analyst for 18 years. A number of free to access articles written by Peter Temple can be found here and may be worth a read if your considering buying CFD’s Made Simple. 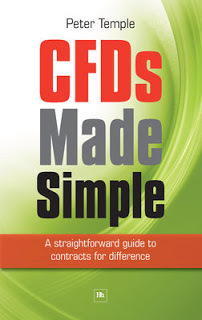 The book covers all the key differences between CFD’s and other ways of trading the financial markets including Spread betting and traditional share trading. It also gives some good details on the how leverage offered by CFD’s can be used to a traders advantage. Peter Temple covers all of these topics in a concise and accessible way and he should be commended for doing so. However much of this information is available for free online, though I do have to say that Peter Temple provides a concise and accessible presentation of this information. However the book really falls down in other areas. For example there is no real information provided on technical analysis, something that many CFD traders are deeply interested in. For this your going to have to purchase another book. There’s not much covered about what systems a trader could use to trade CFD’s or information on how to be successful at trading Contracts for difference, the book is mainly concerned with the workings of Contracts for difference. All in all, the book doesn’t make for a bad introduction to the actual workings of Contracts for Difference. But this is generally not what people are looking for when they purchase a book on CFD’s, what they want is a book which explains the workings of CFD’s as well as introducing them to some of the important concepts of trading. Allowing them to go on and trade successfully for themselves, in this regards Peter Temple’s book fails which is why I personally don’t feel that it is worth the money. Regulation: No offical governmental regulation only psuedo-regulation from the FMRC. Instruments: Forex, Commodities, Stocks, Indices and Bonds. Special Features: None of any note. Leverage: Of 300:1 on Forex pairs but otherwise varies instrument to instrument. 4XP’s trading platforms are all powered or provided by MetaQuotes the well known creator of the popular MetaTrader trading platforms. 4XP offer both the old MetaTrader 4 platform and the new MetaTrader 5 to their clients who are free to choose what platform to use dependent on their personal preference. Many people are familiar with the offerings from MetaTrader and will take like a fish to water when using 4XP’s versions of the platform. 4XP also offers a web based platform again powered by MetaQuotes, providing quite a lot of the functionality included in the more comprehensive downloadable MetaTrader platforms. Quite nicely 4XP also offers a mobile based trading platform which allows users to trade on the move, while the functionality is pretty basic it still allows one to open and close positions with ease. All in all when it comes to 4XP’s platform it’s a pretty standard offering. When it comes to special features there’s nothing much to talk about. 4XP do offer some limited educational tools but such as one to one coaching, webinars and the possibility to open a demo account. But these kind of educational tools are pretty standard at most Contract for difference brokerages. The Spreads on offer 4XP are fixed and pretty unremarkable with the tightest Forex spreads being three pips. While the spreads on offer at 4XP for major Forex pairings aren’t competitive their not actually awful either. However, when it comes to minor pairings the spreads are awful with some being absolutely massive. The spreads on the other instruments aren’t particularly great with some of them being absolutely massive, strongly suggesting that 4XP is a pure and simple bucket shop. You could find a much better deal with a properly regulated MiFID brokership, who would most likely offer you far tighter spreads as well as their being proper regulatory oversight. The customer service provision at 4XP hasn’t got the best reputation around, with many being dissatisfied with the service they have provided. Some have complained of very aggressive sales tactics in order to drive as much business to the company as possible. Their have also been complaints about 4XP failing to respond to problems and complaints that their customers have been experiencing with individuals often being forced to take their grievances to Forex review sites in order to receive any proper response from 4XP representatives. Which quite frankly is not good enough. Though it must be said that representatives do their utmost to resolve these disputes when they do reach various Forex review sites, this may be just to preserve their public image. 4XP claims to be regulated by the FMRC. However the FMRC is not a proper governmental body, it is rather a non-profit organisation which charges companies a fee in order to become regulated. The FMRC doesn’t have any legal powers over the companies it regulates and can’t ensure that client monies are properly segregated from the companies. This isn’t at all satisfactory especially when their are major industry players who are fully regulated by reputable regulatory bodies. For example their appears to be an endless list of different MiFID regulated brokers out there who offer a better overall service than 4XP. So why you would choose to risk your money with an unregulated entity such as 4XP is beyond me. Overall, I can’t see any reason why you would pick 4XP to act as your broker. Especially, when there a huge number of properly regulated European brokerages out there. Instruments: Forex, Oil, Indices and Metals. Features: Demo accounts and social trading facilities through Mirror Trader. Leverage: Up to 100:1 though leverage varies depending on the particular instrument being traded. Being a Safecap Investments Ltd. brand means that the range of platforms offered by ForexYard is very similar to those offered by its sister site Markets.com. 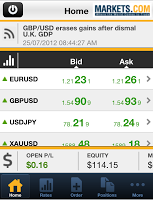 The main platform offered however is the well known MetaTrader 4 and functions just as you would expect it too. Their is also the option to downloading another trading application which itself is perfectly functional though it’s not as sophisticated as MetaTrader, though it does allow you to open and close positions with ease. Their is also a web based trading application which again while not hugely sophisticated is perfectly functional. Their is also the option to use the ForexYard mirror trader which is pretty much a standard social trading application, though I’m sure this option may appeal to some individuals. Thankfully ForexYard supports a number of different mobile trading applications and can support trading on the majority of Smartphone operating systems, which allows an individual to be able to trade on the move. There’s nothing particularly special about the ForexYard offering with the offering seeming to be lacking some of the polish of the other Safecap Investment brands. However their is still the option to open a demo account. But apart from this I can’t really see anything unique about the ForexYard CFD offering. Though I’m sure many people may find the Mirror Trading application appealing. As ForexYard is part of the Safecap group the spreads offered at ForexYard are the same as the spreads offered by the companies in the group. The spreads at ForexYard are very attractive in comparison with some of the other well known Contract for difference providers. While the spread on offer at ForexYard aren’t as good as the spreads at the most competitive brokers there still pretty reasonable and would still give a trader the chance to make some quite decent profits. All in all the spread offering from ForexYard is pretty competitive if it’s not the best value provider in the marketplace. Back when ForexYard wasn’t part of the Safecap Investments group, the company didn’t have the best reputation for providing quality customer service. It appears now that ForexYard shares its customer services facilities with the other Safecap group companies so of which have a quite decent reputation when it comes to providing customer service. There is certainly a wide variety of ways to get into contact with customer service including a number of toll free numbers and numerous email addresses. There is also the option of talking to a live chat operator which has become a standard of Contract for difference customer service provision. Customer service is available 24/5. ForexYard was an unregulated Israeli brokership until in 2011 Safecap Investments took over the company and brought it under it’s regulatory umbrella. Until this time ForexYard had a slightly dubious reputation in many people’s eyes, however it has to be said it still had quite a strong client base. One which many broker’s wouldn’t mind having. Since 2011 ForexYard has been regulated by Cysec of Cyprus. Cysec is a well known regulator in the industry due to the fact that a large number of contract for difference providers are regulated in Cyprus. While it is generally held that Cysec regulation isn’t the toughest the fact that it is part of MiFID means it has to obey certain minimum standards allowing ForexYard to operate throughout the European Union. And it has to be said that Safecap Investments Ltd. currently has a spotless regulatory record and hasn’t been fined or penalized by Cysec. Overall, the Contract for difference offering from ForexYard is pretty reasonable however it is not going to set the world alight either. Regulation: UFX Bank was totally unregulated and was widely reported to be engaging in highly unethical (if not illegal) practices. At some point in 2011 UFX Bank renamed it self UFXMarkets and became regulated in Cyprus under the authority of CySec. However it has been reported that many of the alleged questionable practices which were occurring when the company was unregulated are still ongoing til this day. Instruments: Forex, Indices, Stocks and Commodities. Features: No unique or particularly impressive features to mention. When it comes to the platform there is not a great deal to talk about. UFX Markets only offer one way to trade Contracts for Difference and that’s through a web trading platform, however it has to be said that the platform is not that sophisticated and similar platforms are implemented on many other trading sites. While it will allow you to undertake and open positions and the such it is not a serious piece of trading kit and UFXMarkets doesn’t offer any well known platforms for download such as MetaTrader etc. UFXMarkets also offers the ability to open positions over the phone, however this is one of the areas where many report they experience the biggest problems with the company. With many customers reporting their account manager pressuring them to opening very risky positions they didn’t intend too. If this in fact the case it very disheartening to hear as it is a serious breach of the customers trust. When it comes to special features etc, there is not much to comment on. One point UFX Markets often likes to sell its self on, namely that the company gives you a personal account manager is quite disputable as many have said that has been the cause of a great deal of their problems with UFX Markets. The spreads listed on the website aren’t particularly great a 5 Pip spread on GBP/USD is particularly poor with many other companies being able to offer much tighter spreads on such major Forex pairs. The situation is much worse when it comes to some of the exotic instruments with some of the spreads being so wide it is hard to see how an individual could make any money at all. While I’m sure their are brokers with even worse deals on the table, it seems hard to say that the spreads at UFX Markets are competitive. Especially when reputable companies such as GFT offer extremely tight spreads. This must be one of the area’s where UFXMarkets falls down the most. Their are numerous reports across the web about how UFXMarkets applies a lot of pressure on their clients to increase the amount of money deposited them offering huge deposit bonuses and then lock in their funds claiming that they can’t withdraw there cash until the reach certain trading limits. There seems to also have been instances where UFXMarkets have told their clients that they will be unable withdraw their deposited funds unless they enter into one final trade. Which often goes disastrously wrong leading to the clients whole account being depleted of funds often meaning the said client has lost several thousand dollars. Many reports of such instances can be found on a number of different websites from a number of different sources. This has lead many to conclude that UFXMarkets is a scam. UFX Bank operated from 2007-2011 unregulated with a number of warnings being made by regulators against people investing with the company (one of which can be found here and another here). However in 2011 the company stopped operating under the name UFX Bank and instead changed its name to UFXMarkets. The old UFXBank page used to redirect to UFXMarkets, it was around this time that UFXMarkets managed to acquire a CySec licence. Meaning that the rogue firm now had a licence to operate within all of the countries of the European Union. Many thought this would lead to a change in behavior however it appears that UFX have continued to operate in exactly the same manner as before. It has been reported that a number of former customers have reported UFXMarkets to CySec, however as yet no action has been taken. This could be either due to the fact that UFXMarkets has not broken CySec regulation or due to the fact that there is an ongoing investigation being undertaken (regulators often take a while to take action). I have also noted that some of UFXMarkets advertising banners seem to break MiFID regulation. There is particular regulation aimed at protecting retail consumers (advertising has to carry proper risk warnings etc.) and it appears that some of UFXMarkets advertising is in breach of this. Overall, all of this evidence which continues to mount suggests to me that one should avoid UFXMarkets like one would avoid the black death. Features: Ability to trade bonds, a range of platforms, demo accounts and social trading. Leverage: Up to 100:1, though maximum leverage varies instrument to instrument. In further addition to this Markets.com offers a downloadable CFD platform. This platform while not as complicated or sophisticated as MetaTrader is still a pretty decent bit of kit, though I personally wouldn’t opt for it over MetaTrader. It may be more suited to those who don’t wish to use the MetaTrader software. There some things that are pretty unique about the offering from Markets.com. For one I haven’t seen another CFD provider offering the ability to trade Bonds, while there is a very limited selection of bonds available it is still a nice touch. As you would normally expect there’s the option of opening a demo account which is something that is pretty standard feature among CFD providers these days. However having the chance to try out the service before depositing real money is always a welcome feature. Another feature which is pretty neat while unique is the social trading features available at Markets.com, the Contracts for Difference industry has recognized this as a real growth area. The Market AutoTrader allows customers search for live signals as well as copying strategies from other traders. You are then able to create a trading portfolio of strategies which you can implement which will lead to you automatically mirroring these strategies. Of course you can set various risk management strategies to control the risk of these automated strategies. While not as complex as the copy trading system at eToro, it is a pretty interesting feature of Markets.com and is something that many people might be interested in. When I recently took a look at the spreads offered by different Contract for difference providers I found that Markets.com was relatively competitive. While it wasn’t up their with the most competitive providers, it was competitive with a number of highly well regarded Contract for difference providers. Beating a number of properly regulated providers quite significantly including easyforex, eToro and Plus500. It should also be noted that some of the spreads offered at Markets.com cannot be compared with rival providers this in part due to the fact that Markets.com offers a number of products that aren’t available at other providers, for example I haven’t seen Bonds offered at any other Contract for difference provider. I would say all in all Markets.com offers pretty good decent value for money, though you can find tighter spreads out there. Customer services at Markets.com appears to be pretty good, with 25 different telephone numbers offered allowing people from a number of different countries to get into contact with the company at a relativity low price. However it is a bit of a shame that it costs money to get into contact with them. Though it should be pointed out that the phone numbers aren’t the only way to get into contact with Markets.com. For, example a number of different email addresses are available for customers to contact the various departments of Markets.com. There is also the option of contacting the team through the 24/5 Live Chat feature, when I attempted to do so the staff were quick and responded helpfully. In general people seem pretty satisfied with the customer services provided by Markets.com though there do seem to be a few complaints. However I haven’t seen anything truly damaging said about Markets.com. Markets.com is the subsidiary of Safecap Investments Ltd. whose primary seat of regulation is with CySec the regulatory authority of Cyprus. However it is also regulated by the the South African regulatory authority the FSB, which isn’t something I have seen from a European broker before. After a long search I was unable to find any record of Safecap Investments Ltd. having received any fines or penalties from any of the regulatory authorities that they are registered with. While not everyone is satisfied with CySec regulation it appears that one shouldn’t have any serious concerns about the regulation of Markets.com. Overall, I contend that Markets.com makes for a pretty good offering for those interested getting into CFD trading.